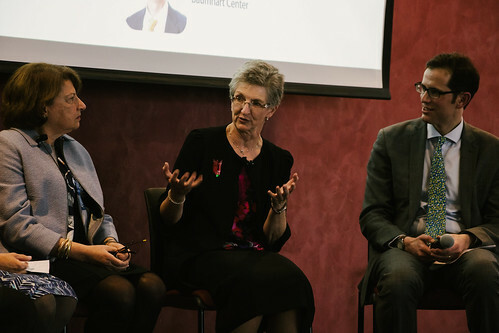 Loyola President Jo Ann Rooney (center) said that the ability to keep going and "be a perpetual, lifelong student" is necessary for a strong leader. Every seat was filled at the Baumhart Center panel Do Well and Do Good, which featured four leaders who have served at the highest levels of the private, public, and social sectors. After sharing their individual career journeys, the panelists examined what it takes to be a successful leader across sectors and how experiences in multiple sectors helped them advance in their careers and make a social impact. To help the people around you put their best work forward, Fran Edwardson said it’s important for a leader to be able to effectively describe their vision. She indicated that having a precise vision enables leaders to maintain the “accountability of having to own [their] decisions” throughout any process. Helen Gayle spoke of the often overlooked importance of being able to "boil down information into bite sizes." She explained that passionate people generally have a “tendency to want to say everything, but [leaders] need to be as simple as possible and synthesize large amounts of information” to get their message across. In addition, Gayle noted how useful it is to learn the languages of other sectors so you can work well across them. Jo Ann Rooney added that resilience is an indispensable characteristic every leader must have. Rooney addressed the young leaders in the audience, telling them “you are going to mess up—sometimes really publicly— and definitely more than once.” When this happens, “figure out what it is going to take to get up and move again.” She added that the ability to keep going and “be a perpetual, lifelong student” is necessary for a strong leader. Susan Sher, a former chief of staff to First Lady Michelle Obama, asserted that leaders need to be able to “accept things in a culture” that they are not used to. To do this, Sher explained that aspiring leaders should develop a strong set of “transferrable skills” that can be applied across several different settings and cultures—thus increasing their ability to effectively “speak in executive summary” to a wide array of groups. Baumhart Center director Seth Green, who moderated the panel discussion, noted that helping develop these four leadership characteristics are part of the center’s mission. “We are already planning events for fall 2018 that will help students and leaders develop these skills and accelerate their social impact,” he said. View event photos in the gallery below or on Quinlan’s Flickr page.